Kenji Fuijimoto, the Japanese chef who worked for late North Korean leader Kim Jong-Il and his family was headed back to the DPRK on Saturday, Japan's Kyodo news agency reported. 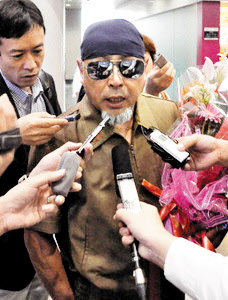 The chef, going by the alias of Kenji Fujimoto, was invited by the new leader Kim Jong-un, Kyodo reported. He previously worked for the Kim family for 13 years and has written several books detailing the secretive lives of the ruling elite. Speaking to reporters at Beijing Capital International Airport on Saturday, Fujimoto said, "I'm not sure when I will get to meet Kim Jong-un. I will be staying in North Korea for two to three weeks. "He said he was carrying a blue-fin tuna as a gift for Kim.